I am trying to clarify what is happening with the traffic on my site. Lately I am being flooded with many strange hits, mostly from US and they seem to only open 1 page or visit for few seconds. 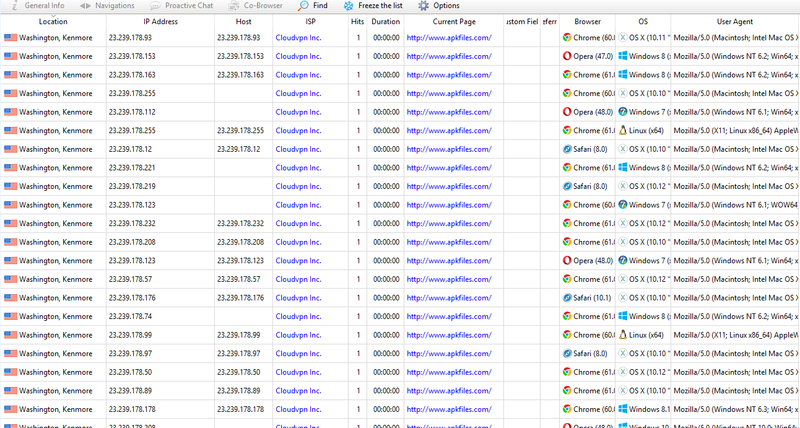 The attached picture shows hits from 22 different IPs at once, all from same provider (cloud vpn). During this time my income from Google AdSense is at a record low and it makes me think these bots eider click on ads or they come from Google and quickly exit the site (back to search), showing a bounce to Google and decreasing my rankings (I am aware many say this is a myth). Google Analytics also shown me an alert that I should look into US traffic because bounce rate is out of order compared to site average. Is that a ddos attack ? An ad clicking attack ? A bounce rate attack ? Just proxies or VPN that change IP with every request ? (user agent seems a bit different thou). On image 2 and 3 I attached activity from some similar bots, all from US and all running windows XP with same screen resolution. Does it look like hits from organic search drops when there are bot hits ? Browse other questions tagged web-crawlers security traffic botattack ddos or ask your own question. A bounce-rate attack to manipulate SEO? What is the reason for this site's sudden drop in traffic? Huge increase in direct load homepage traffic and bounce rate, causes? 80% of Website Traffic coming from Just one Town in USA - Strange? How to block direct traffic spam in Google Analytics?